Up-to-date 4 elements 3 group lens, including 2 lanthanide lens, which can effectively reduce dispersion and improve the edge imaging. Newly improved coating help you get rid of the parasitic light caused by the mutual reflection between lenses. Unique rear lens: better fit the CMOS and promote the imaging quality. Suitable for Canon EOS lens to Olympus or Panasonic Cameras (Can Not Shrink the Aperture). 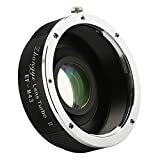 This upgrade lens turbo focal reducer booster adapter adopts up-to-date design and has made great advances in functions. Canon EOS lens to Olympus or Panasonic Cameras (Can Not Shrink the Aperture).